Vivo’s upcoming V15 Pro has been leaked on several occasions, and now an alleged promotional poster of the phone has popped up online, which suggests that a non-Pro variant is also arriving alongside the Vivo V15 Pro. The Vivo V15 and Vivo V15 Pro smartphones are largely expected to be unveiled in India on February 20. The Pro variant has also been spotted as a part of a purported live photo, showing off the back portion of the device. The Vivo V15 Pro is tipped to come with a pop-up selfie camera setup at the back. Mumbai-based mobile phone retailer Mahesh Telecom has tweeted a promotional poster that suggests Vivo V15 will also launch alongside Vivo V15 Pro. The poster shows the back and front portion of the Vivo V15 Pro smartphone, and the pop-up selfie camera is seen to jut out from the top right edge. The phone will presumably sport an all-screen display, and the back can be seen housing a triple rear camera setup aligned vertically. The tipster also notes that the pop-up selfie camera houses a 32-megapixel sensor. 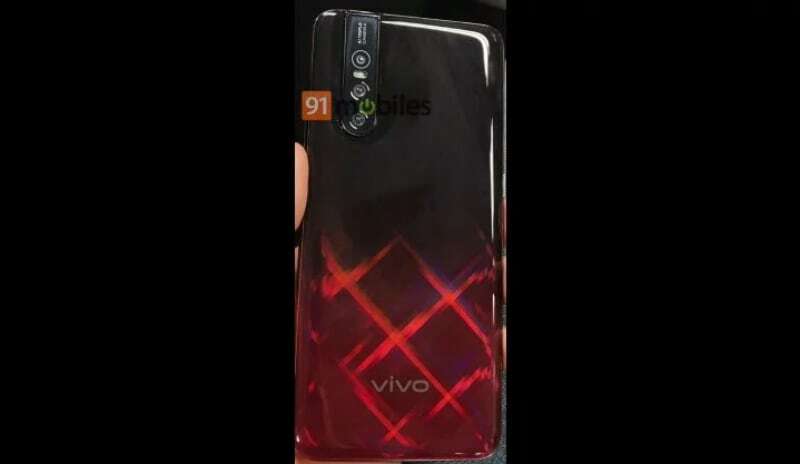 Separately, 91Mobiles has also published an alleged live photo of the Vivo V15 Pro. The photo shows the phone with a gradient red-black back panel with glossy finish and a triple camera setup at the back with flash support. Thanks to the promotional poster, we already know that the phone is expected to arrive in a glossy blue finish as well. The same publication has also shared the expected specifications of the Vivo V15 Pro, and it suggests that the phone will sport an in-display fingerprint scanner, a Super AMOLED display, and Snapdragon 675 SoC. Additionally, it is likely to pack 6GB of RAM, 128GB of inbuilt storage, and a 32-megapixel front shooter. The triple rear camera setup will reportedly come with 48-megapixel, 8-megapixel, and 5-megapixel sensors. The Vivo V15 Pro is set to launch on February 20 in India, alongside the Vivo V15.